Creating a “smart imports” program could make excess solar a solution instead of an issue. As problems go, having too much solar power is not a bad one to have. It's also an issue that has actionable policy solutions. In Hawaii, solar installations have grown rapidly since the first net energy metering (NEM) law went into effect in 2001. Measured per capita, Hawaii ranks third for the most solar in the U.S., behind only Nevada and Utah, both of which rely primarily on utility-scale solar rather than behind-the-meter solar, as is the case with Hawaii. That said, the level of solar installations in Hawaii is still low in the context of reaching 100 percent renewable energy for electricity generation -- Hawaii’s official goal since 2015. There is a very large potential for solar growth in Hawaii, on rooftops, parking lots and open space. Unfortunately, Hawaii’s solar industry is dying before our eyes, with average installations plummeting by 56 percent in the last year alone. The number of PV permits issued by the County of Maui fell 84 percent this past third quarter compared to the same period two years ago, according to data compiled by long-time solar watcher Marco Mangelsdorf. Aside from the pre-net-metering Standard Interconnect Agreement, which doesn’t provide any credit value for exported solar power, the remaining option for homeowners and businesses to go solar in Hawaii is the Self-Supply option -- the option that requires including pricey batteries on-site to absorb surplus solar power rather than sending it to the grid. We can expect to see even more decimation of the solar industry as these programs officially end this month. What can policymakers do to stop the bleeding, and, better yet, ensure that solar jobs and solar installations return to a path of growth? There are a couple of efforts currently underway that may help: a pending community solar program and a pending “smart export” program. I’m looking forward to seeing the final details of the community solar program, and I’m cautiously optimistic that it will help solar grow incrementally. It won’t, however, do much at all to help the residential solar market, which is in an apparent death spiral due to the end or pending end of net metering and grid supply capacity on the populous islands of Oahu, Hawaii and Maui. The smart export program would “compensate customers for exporting electricity back to the grid during peak demand times, which is usually in the early morning hours and in the evening,” according to a Pacific Business News story on the pending program. The sticking points for the proposed program are the capacity allowed for each island plus the compensation rate for power sent back to the grid. The point of the smart export program is to compensate and thus incentivize homeowners and business owners interested in solar to include battery storage and earn revenue from the “smart exports” during times of high demand on the grid. I suggest, however, that Hawaii needs a more comprehensive and long-term solution. Solar could in theory provide all of Hawaii’s energy needs (along with existing renewables like wind power and some small hydro and biomass plants). The “in theory” qualification is required because the sun only shines part of the day, and solar production doesn’t coincide with Hawaii’s peak power demand period in the evening. We have already seen cost-effective solar and energy storage solutions implemented, but we need far more. The Kauai Island Utility Cooperative (KIUC) recently completed an impressively low-cost contract with Tesla for up to 28 megawatts of solar-plus-storage, for about 14 cents per kilowatt-hour. This is cheaper than fossil fuel alternatives. And the costs of solar and storage are declining rapidly. The problem is that energy storage is generally not yet cheap and plentiful. It’s not clear how much of Tesla’s project for KIUC, for example, is a “loss leader” in order to gain market share. What we do know, however, is that with the rapidly declining cost of energy storage, we will see increasingly competitive pricing. It becomes, then, a question of timing: How long should we wait for cost-effective and widespread deployment of solar and storage? What if we could achieve this in the near term, cost-effectively and with significant benefits to Hawaii’s economy? This is where policy can be helpful. 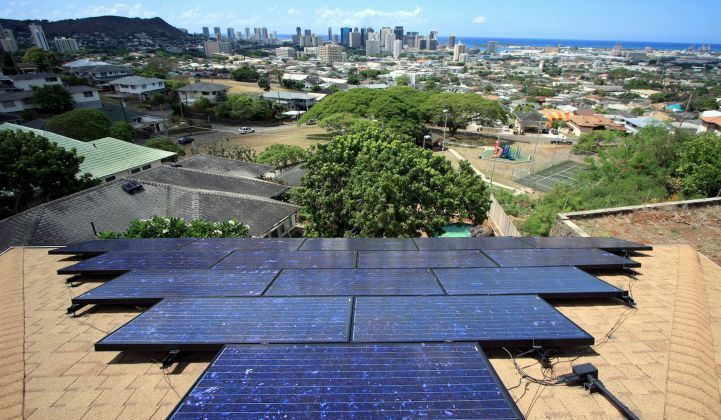 Some states are already seeing too much daytime solar, and Hawaii is at the front of this development because each island has its own power grid. Too much daytime solar is why the grid supply option has expired or is about to expire: Hawaii’s island grids can only handle so much daytime solar without running into problems of excess power. But what if this excess power became a solution rather than a problem? Energy storage can become cheap when there is zero cost for charging, or, better yet, storage operators are paid to use excess power from the grid. This is called “negative pricing” and is already a regular occurrence in some markets like California (too much solar power at certain times) and Texas (triggered by too much wind and natural gas at certain times). Hawaii has no power sales market, but policymakers could create the equivalent of markets by providing programs that allow large-scale power users to earn revenue by absorbing/importing excess solar power. 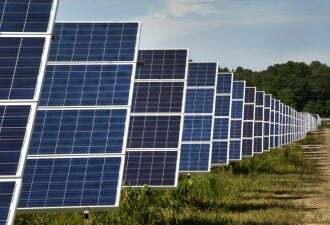 Such a program would work effectively by providing either a defined rate for absorbing excess solar power, or creating a market mechanism that pays higher rates when there is more excess solar power and lower rates when there is less solar power. Large-scale power consumers could, by absorbing either free or revenue-positive (negative-priced) excess solar power during the daytime, use the absorbed power for nighttime power demands. As long as there is enough daytime power consumption, there is no limit, in theory, to how much solar could be installed on homes and businesses. A smart imports program would not need to be limited to energy storage (whether the storage is battery technology, flywheels, compressed air energy storage, pumped hydro, etc. ), though this would be the default. Other power-intensive technologies could be incentivized under the same program, such as computer servers for cloud storage, cryptocurrency mining, or marijuana growing. These are all large and growing global industries. Hawaii and other states with excess solar power could do much to grow their economies by attracting these industries with cheap or even revenue-positive electricity. For example, a 1-megawatt Bitcoin mining operation, discussed in my last GTM article, would require up to 8,760 megawatt-hours of electricity per year. About one-fourth of this could come from importing excess daytime solar power (about 6 hours a day), without any onsite storage. And the rest could come from grid power or onsite battery storage that also imports excess daytime solar power. The latter would be preferable because Hawaii’s grid power costs are so high. This 1-megawatt operation would cost about $3 million in capital costs and would require a medium-sized warehouse to house the mining machines and battery storage. These facilities could be placed anywhere that there is sufficient grid infrastructure and appropriate zoning. A hundred such facilities -- whether it is cryptocurrency mining, cloud storage or marijuana growing or some other high-power-requirement industry -- on the Big Island and Maui, and 300 such facilities on Oahu, a far more populous island, would result in 500 total. If the average capital cost of these facilities is $3 million, this amounts to $1.5 billion (500 x $3 million) in new economic growth on Hawaii’s three biggest islands. The community development and job potential of spurring these new industries should be obvious to policymakers. And it could save Hawaii’s struggling solar industry. With solar power installers eager to find new business, this development model is ready for implementation. Realistically, it would take at least a year for the Hawaii Public Utilities Commission to scope and implement a new program like this, and probably longer. But given the potential for economic growth and the slow-moving crisis that Hawaii’s solar industry is facing already, there is good reason for policymakers to move with a sense of urgency.